← Here. Drink This. Its Algae. Blogging ushered me into this community of great thinkers young and old. I love the idea of having a peek into the serious assortment of brains that is bloggers. Brains I would otherwise never have gotten to interact with in the brick and mortar world. Contrary to possible expectations, I don’t talk much. Even if I did I doubt I would have talked this blog. Now I heard that bottled up ideas result to voices in the head. If I had not churned out 200 articles in my two or so years of blogging, I’d probably be stack raving by now. 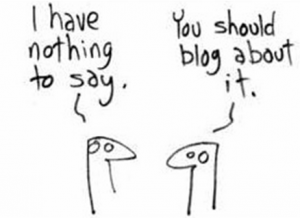 Blogging makes me laugh. In the course of my blogging I’ve encountered many crazies who make me laugh real hard. Online, I relate better with good natured virtual conversations and humour than I do with manufactured jokes, quotes, inspirations and such. Blogging got my online persona out there and as a direct result of that, I’ve made some not too few coins. Whether for fun or for money, blogging shall inexplicably be a contributing factor to my overall growth. I’ve known a lot of people, made a lot of friends, gone on to meet some, developed and executed other ideas in the real world and …. grown. No I did not meet McShiko from the blogs. I like to try things. I’ll try out everything within my reach at least once. Key words ‘within my reach’. Thats why I intend to milk a goat soon. Ish like going to space with Richard Branson is not within my reach. Neither is Karaoke. They kept telling me I could write. I kept asking write what. Write where. Then blogging came about and the rest is current affairs. When the Lord asks me what I did with my life, I seriously think I would say I put whatever little writing ability I have to some use. In here I have a small time family of me own who I believe would offer support and encouragement in a jiffy if I put a cry out there. Is it silly to say that I love Decor? And that in a blog I have an online house to decorate as I wish? Splash colour, put bows, ribbons and nice little badges if I wanted to? I think in the end I blog because I can. Before I started blogging I was warned that I would have to develop a thick skin because some mean people out there would come and say mean things. I’ve never seen the need for that because I don’t see why someone should come to my personal space and spill vitriol. If my space is any offensive, you kinda sorta just don’t show up no? If blogging involved having to deal with barbs and online feuds daily then I really would have to think twice about it.